A co-worker walked up to my desk. “Kurt Cobain killed himself,” she said. “Uh-huh,” I said. “Right.” She looked uncertain. This was a rumor that had been circulating for a couple of years at this point. That Kurt Cobain, lead singer of Nirvana, who struggled so publicly with heroin addiction, fame, his wife and fellow addict Courtney Love, and Pearl Jam lead singer Eddie Vedder, had committed suicide. “‘They’ve’ been saying that for, like, the past two years,” I responded. 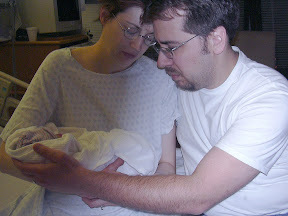 It was April 8, 2004. I came late to Nirvana. Like, say, summer of 1992 late. After my Pearl Jam revelation, I made my way through Seattle-area grunge: Screaming Trees (lead singer of which, Mark Lanegan, was clearly Vedder’s voice coach), Soundgarden, Alice and Chains, and so on. Why yes, I was a sunny, happy post college graduate. (Not.) Why do you ask? Although Nirvana’s single “Smells Like Teen Spirit” had caught my ear, it wasn’t until I saw the video with the tattooed cheerleaders that I decided to pick up the CD. I distinctly remember hoping that it wasn’t just that one song. To this day, Nevermind resides in my top five albums of all time. I know Pearl Jam and Nirvana were lumped together in the “grunge” music category. Out of the necessity that we have for labeling and categorization. I tend toward seeing their differences, though, especially these many years later. Pearl Jam had a dark romance to them. Nirvana were nihilists. Pearl Jam’s music was tightly focused, driven, while Nirvana’s hovered at the near edge of chaos. Both bands knew their music history — they truly sensed their roots. PJ were rooted in Neil Young and other ’70s-era bands, plus the Ramones; for Nirvana, it was classic rock, and punk and alternative rock forerunners (The Stooges, Pixies). While both groups seemingly struggled with their sudden fame, where Pearl Jam and especially Vedder learned to channel and use the spotlight, Cobain simply turned into a deer in the headlights. Then imploded. Pearl Jam went from angst to activism; Nirvana, although they made an amazing third album (In Utero) (counting Bleach as their first) and an amazing MTV Unplugged episode, didn’t go farther than 1994. Once upon a time, WYEP had a Friday night show that focused on very new music, a lot less Joni Mitchell and a lot more… well, at that time, Nirvana. An acquaintance of mine, Don, was the DJ. And when, that evening on the air, Don announced Kurt Cobain’s body was found, I believed him. Don’s voice was hushed, serious, that of a fan already mourning a dead star. “Are you okay?” I blurted. We talked for a while before he had to get back to DJ’ing. I told him about what my co-worker had said earlier in the day. “I didn’t believe her,” I said. “I don’t blame you for not believing her. Cobain would be dead a hundred times over if every rumor of his death were true.” He went back to his shift. My second thought was for his baby girl. Although I never bought into the idea of Kurt Cobain as “the voice of a generation”, it’s not as if he didn’t have anything to say. He was an artist of his era trying to capture, if nothing else, his own intense experience. He was troubled, plagued by chronic pain, tortured by his fame, and, ultimately, not strong enough to take on the weight of his own world. But Nevermind — along with Ten — launched a thousand alternative rock ships. And if I can be nothing else, I can be grateful for that. Well, that was fun. Civil disagreement, uncivil disagreement, misunderstandings, hugs, and a lot of interesting views. Thanks. What shall I tackle next? The End of Men? Are “men finished“? What about men and women moving between spheres? Are women the new men? What about peanut butter? Smooth or crunchy? What about organic peanut butter? 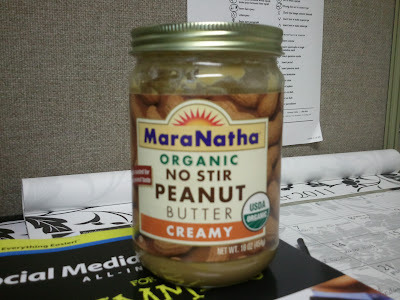 I prefer to buy organic peanut butter because it usually has two ingredients (peanuts, salt). Organic peanut butter drives Dan batshit crazy. As you may or may not know, organic peanut butter tends to separate, with the oil coming up to the top. Before you use it, you have to stir it and reincorporate the oil. Dan hates doing that. I will admit, the process can be messy when opening a new jar. Oil can slop out and run down the sides; it’s oily, messy, sometimes sticky, a PITA. But it’s not exactly the end of the world. Usually, once mixed together and refrigerated, the peanut butter stays mixed. So I keep buying organic PB. And Dan keeps bitching about it. What’s your favorite controversy this week? (This is a continuation of my replies to @mindymin from yesterday’s post. I think she makes valid arguments, and I completely understand her POV, even though I don’t share it. Also, I don’t think this is a matter of taking sides — I think it’s a matter of recognizing that workplaces can’t be one size fits all any longer. IMO, anyway. This is a major story line on Parenthood, the NBC show, right now. A once-senior executive of a shoe company is thinking of taking a job driving a truck to deliver beverages just so 1) he is working and 2) he can appear to be providing for his family again. But at a significantly reduced wage and with a job that takes him away from his family, what is he really gaining? Slate examined this too, what people — the long-term unemployed, specifically — are doing to get back to work. I don’t think this article was critical enough. They simply reported what strategies people adopted to get back to work. They don’t ask, “Is it [the particular strategy] worth it?” I think that should be examined also. These are hard questions. It’s a hard economy right now. Losing my job would be devastating in economic terms. Would my family adjust? Yes, we would. I think there are things that I could do, steps I could take, to get back to work in some fashion without making the current sacrifices I am making. But until I’m up against the wall, I will keep making the sacrifices I am making (a long commute, missing my children, etc.). Also, from yesterday’s comments, what do you think about @FunkyDung’s point about SAHDs? They are fighting on a different front for some of the same respect that SAHMs have access to: community, acceptance as primary care givers, etc. “My strong feeling is that women have changed enormously to accommodate being mothers and working. But the world of work has not changed to accommodate the fact that now almost half the people in work are women and many, many hundreds of millions of them are mothers. … Why should I deliberately limit my family because work is too hard to combine with motherhood? How about work becoming slightly easier to combine with motherhood so that women can fulfill both the things they want to do? Which is to have wonderful children which are the great lights of most of our lives and to have a career…. This is a quote I heard over the weekend on NPR’s Fresh Air. I immediately fell in love with this woman (hear the entire interview here). I have so many thoughts about it, I can’t even begin to sum them up. But I wanted to get this quote out there. What do you think? I have plenty to say about Podcamp Pittsburgh (most of it good), but I need a day to regroup, recharge, and hang out with my kids. Gosh, I missed them so much yesterday! Oh, and clean my house. Going to get on that right now. Once I’m not out of breath from exercising. My strength and tone is improving, but my cardio is shot for some reason. It is actually possible to grieve for someone before they die. I’m doing a Podcamp session tomorrow on Blogging Grief, so I’m reposting this today. As an illustration of how I have grieved, and how I have written about it. My grandmother died more than a year ago. I’ve been missing her a lot longer than that. As the nurse was helping her into bed that night, she discovered a photo in her pocket. She looked at the picture, a little creased from spending the day in her pocket. 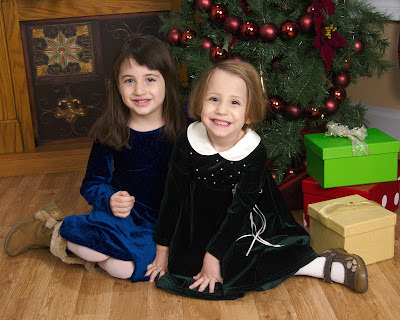 Two little girls smiled out of it: a blue-eyed, dark haired beauty, and a green-eyed blondie with mischief written all over her grin. She wondered whose children they were. Certainly not, probably not her own. She was an old lady now. Her daughter’s? She did have a daughter, she thought she recalled. Had her daughter had children? Her daughter’s daughters? Her daughter’s daughter’s daughters? Oh, she thought, oh, they probably aren’t mine, she thought. Someone probably gave that photograph to me by mistake. But wouldn’t it be nice if they came to see me, too? I would hug them and give them cookies. They look so sweet. Such sweet little girls. I wish I knew who they were. Both these conversations took place Saturday, on our way to Target. Flora: Remember when we went to Erie? Flora: Remember when we went to that huge amusement park? Me (scoffing at Waldameer being referred to as “huge”): Yes. Flora: And we went on that train ride? Flora: That was the perfect ride for Kate. Because it was called Little Toot! Get it? Me: Because Kate toots all the time? Flora, laughing: Yeah! We should call her Little Toot! Me: What would we call Daddy? Big Toot? 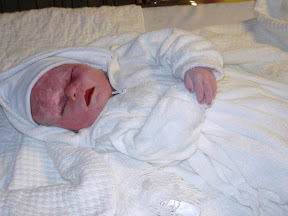 Flora: And when Michael starts tooting, we’ll call him Tiny Toot! Me: What are you girls going to be for Halloween? Kate, dreamily: I’m going to be a pretty, pretty butterfly. Flora: I’m going to be a vampire! Or a skeleton. What’s scarier, a vampire or a skeleton? Flora: What’s scarier? A vampire, a skeleton, a ghost, or a zombie? Kate: I’m going to be a zombie! Flora: I’m still going to be a vampire. 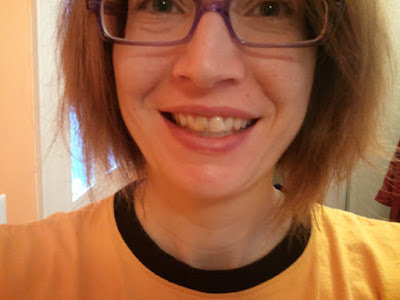 I’m finally doing something about my front tooth. But getting my tooth fixed? I can’t overstate how great that is, how much of a difference it makes. And as I’m going to be talking in front of a bunch of people for several hours on Saturday, it’s one less thing for me to worry about. I’d still like to get my hands on a whiskey milkshake for dinner, though. 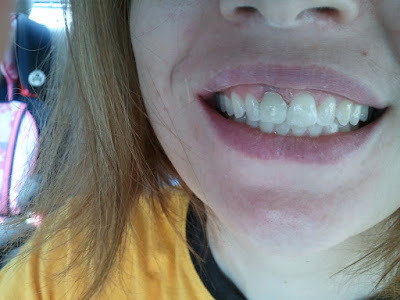 Still to come: Tooth with Permanent Crown. Wish me luck!